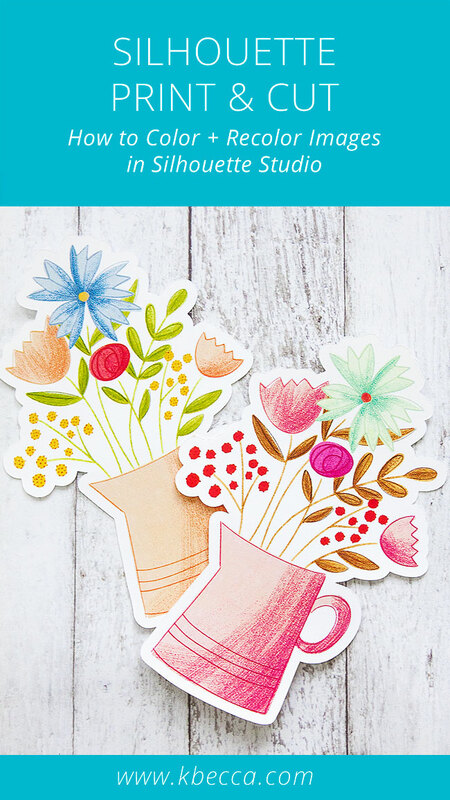 Have you ever wanted to know how to make a print & cut image from a regular cut file? In this video, I’ll show you how! I’ve touched on this a little bit in a couple of the earlier videos in my Silhouette Print & Cut tutorial series, but in today’s video I’ll be using a more complex file that actually needs to be reassembled, and I think that these are often just the types of cut files that we’re looking to turn into images for print and cut. 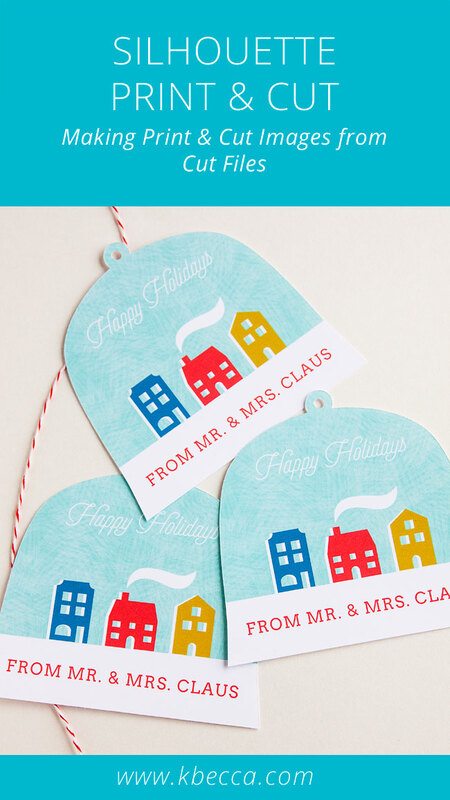 We’ll even personalize our print & cut gift tags to make them our own! Tip : The Align options in the Transform panel in Silhouette Studio are super helpful for files that you need to reassamble because you can line the pieces up perfectly for printing and cutting. 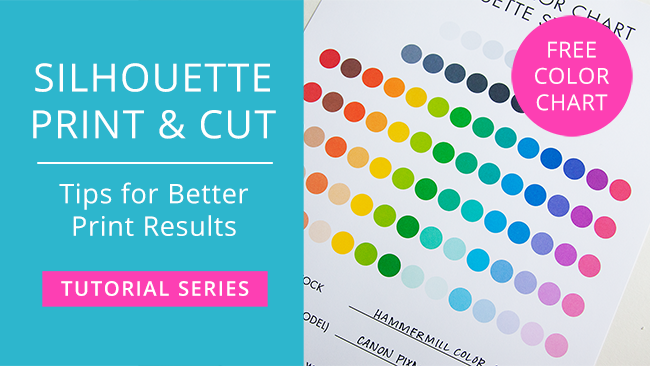 If you’re ready to go beyond using the default color options and color picker tool to choose custom colors for your print & cut projects in Silhouette Studio, then this video in my Silhouette Print & Cut tutorial series is the one for you! 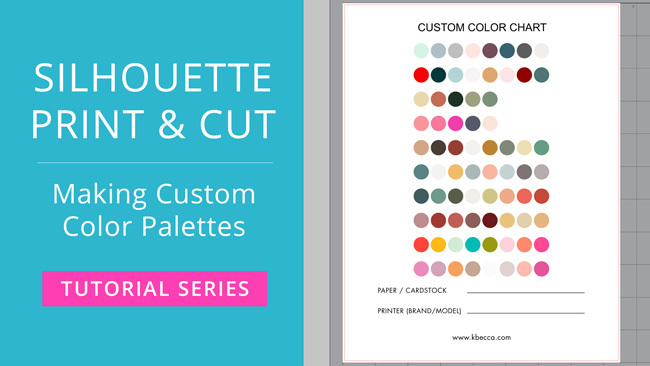 I’ll show you how to find color inspiration and create your own, custom color palettes for print & cut in Silhouette Studio using several different resources that are available to you on the web for FREE. 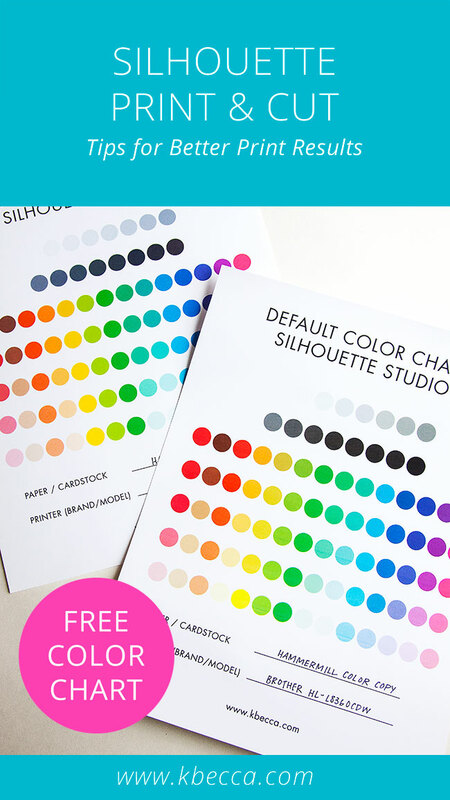 In the video, I’ll also show you how to make a custom color chart using the free printable color chart that you can download in my post about getting better color print results for print and cut. 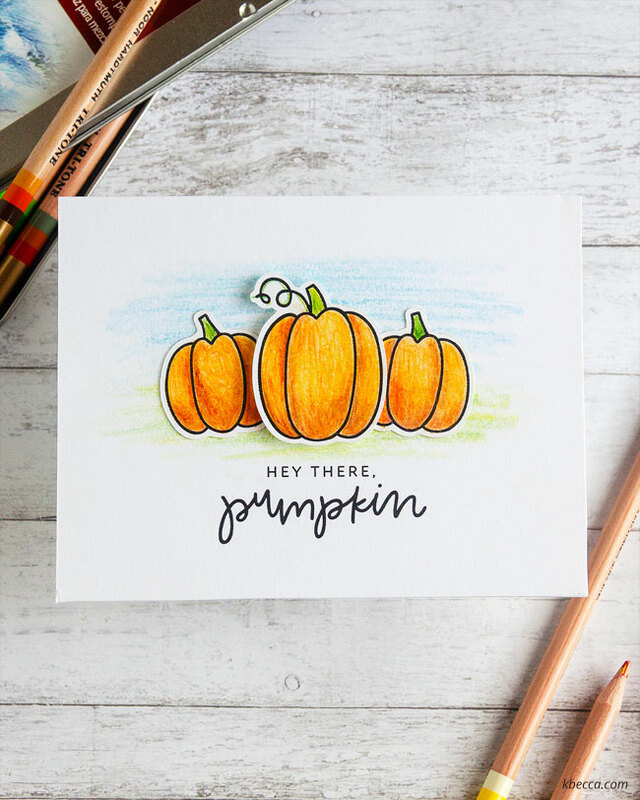 When you’re working with images for print & cut, you’ll often want to either add color (if it’s an SVG or another vector file) or recolor the image (if it’s a raster file, like a PNG or JPG), and in the video below I’ll show you how to color & recolor different types of images for print & cut using the tools and features available in Silhouette Studio. Fill Color : allows you to fill the image with a solid color, either from the default color palette (click the color square for the color you’d like to use while the image is selected) or by choosing a custom color by inputting the HSL values (hue, saturation, light), the RGB values (red, green, blue), or the hex code (a 6 character alphanumeric code for the color). Gradient Fill : the middle icon at the top of the Fill Color Panel, which includes default gradient fill options, as well as advanced options so you can customize your gradient. Pattern Fill : the right icon at the top of the Fill Color Panel, which allows you to choose from a default set of pattern fills. This sub-panel also includes options for rotating, scaling, and panning the pattern. You can use your own pattern fills by either dragging and dropping a pattern from your computer or by clicking on the fill pattern after loading it into your Silhouette library. 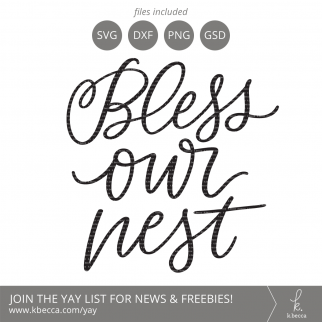 Note : because pattern fills are raster files, their size and resolution is limited, so I recommend not scaling the file up too much because, if you do, it could print out fuzzy and low quality. In addition, if you fill a vector image with a gradient fill or a pattern fill, you can use the Image Effects Panel (the little half-filled circle icon on the far right menu in Silhouette Studio 4) to adjust and recolor the fills. Grey Shade : this option will add a grey tone to your image and, if you slide the slider the whole way to the right, you can transform your image to greyscale. Colorize* : using the Hue slider in this option will allow you to completely change the color scheme of your image. Slide the slider around to see all of the different options. Many won’t look great, but you’ll usually hit upon several color schemes that will work well as you slide the slider around. 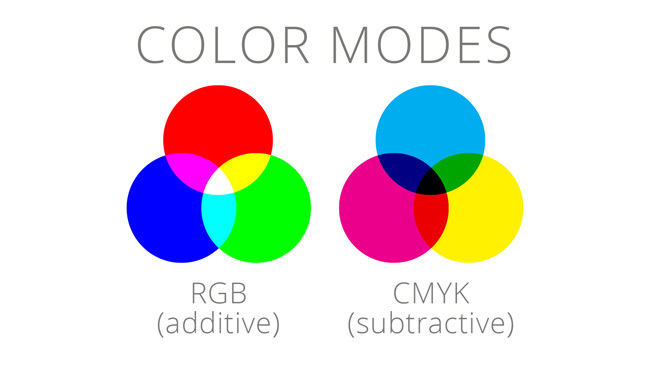 Contrast, Brightness & Saturation* : if your image is printing out on the dull side, these sliders can be a great help. Increasing the Contrast slider can help more details in your image stand out when printed. Increasing the Brightness slider can brighten up your image, and increasing the Saturation slider makes the colors in your image more vivid and bright. Gamma : this option controls lightness and intensity. Sliding the slider to the left will darken and intensify your image, while sliding it to the right will make the image lighter and softer. Invert : this option inverts the colors in your image to the colors opposite them on the color wheel. For example, reds and pinks will change to greens and blues will change to oranges. Sliding the slider to 100 will fully invert the colors. I don’t really use this option because the results aren’t typically great looking. Sepia* : this option adds a sepia tone (a warm, yellow-ish brown) to your images. It’s great if you want to make your images to have an aged or vintage look. Tint* : this option is very useful if your image has a color cast. Use the red, green, and blue sliders to either remove a color cast or to add a tint to an image. Subtle adjustments are best. I like adding a subtle bit of red to warm and brighten an image that’s too blue or has a blue-ish tint, and I also like to use the blue slider to either warm up an image that’s too cool or has a blue-ish tint (slide it to the left to add a warm, yellow tint) or to cool it off if it’s too yellow / orange (slide it to the right to add a cool, blue tint). Shadow : this option doesn’t really work with raster images because Silhouette Studio registers the bounding box on a raster image as the image border, but it is useful for adding shadows to vector images. When you’re working with clipart and images for print & cut, you’re often dealing with just an image and no cut lines. 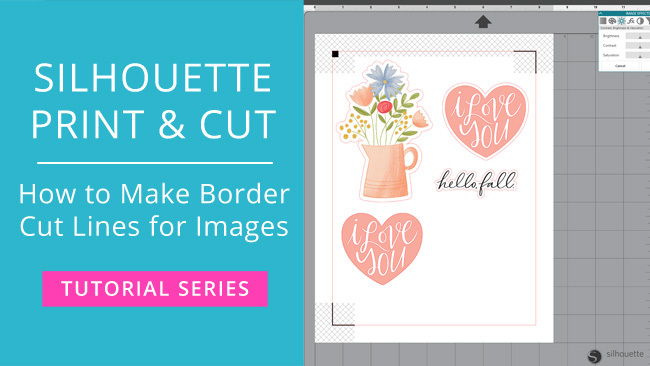 In the video below, I’ll show you how to create custom border cut lines for different types of images, including raster (PNG graphics with transparent backgrounds) and vector (SVG files that you want to transform from cut files to print & cut files). 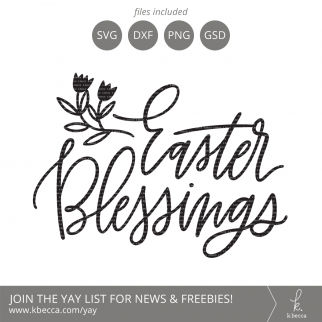 In addition to the images that I use in the video, you can also make cut lines for any type of print & cut friendly raster and vector graphics that you can work with in Silhouette Studio. 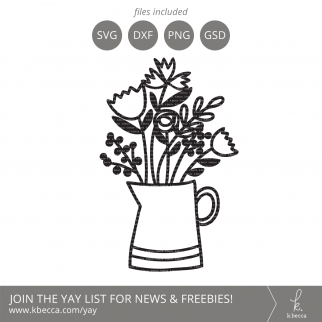 The trace and offset features in Silhouette Studio are your best friends when it comes to making cut lines for images, and they each offer different styles and options so you can create and customize cut lines for many, many types of images, including images with backgrounds that are a color besides white. You may have to play around and experiment with the various trace and offset options to get good cut line results for more challenging graphics, but in most instances it’s doable. 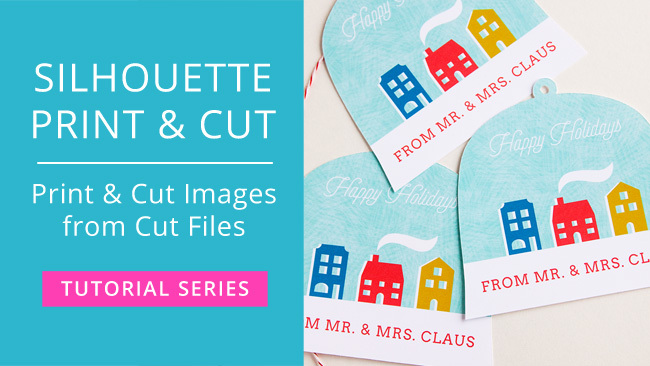 This video is part of my Silhouette Print & Cut Tutorial video series. 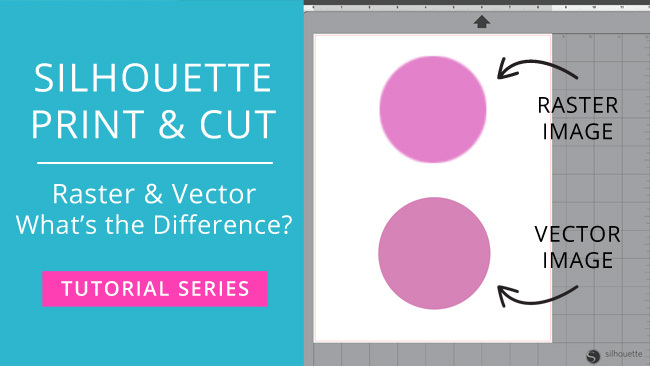 Raster vs. vector images – what’s the difference? 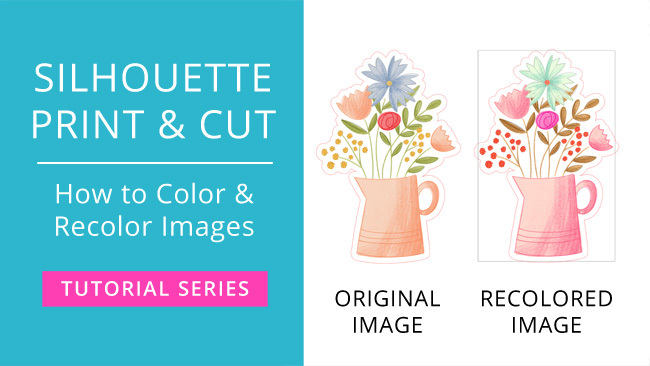 In this video in my Silhouette Print & Cut Tutorial Series, I’ll explain the differences between the two categories of image files and why you would want to use each for printing and cutting. Resolution Dependent : resolution and file dimensions dictate the maximum size of the image, and you can usually scale the image down without problems but have very limited flexibility if you need to scale the image up. Why Use : raster graphics are capable of rendering complex images with lots of detail, and pretty much any photograph or image that you see with that level of detail is a raster graphic. Also, these images can have lots of texture, soft gradients of color, and itty bitty small details, which make them more visually interesting. Raster file sizes are larger, but raster graphics are much stronger when it comes to the small details than vector images. Resolution Independent : while raster images are made from individual pixels, vector images are made up of paths, each of which has a fancy mathematical formula associated with it that tells the path how it’s shaped and what fill color and / or stroke weight and color it has. No matter how small or large you make a vector graphic, the mathematical equation will remain the same, so vector graphics can be scaled to any size without losing quality. 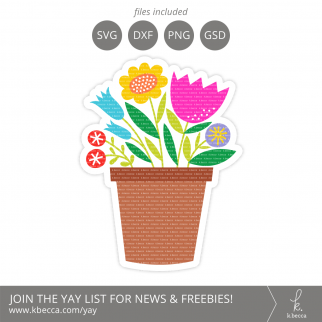 Can Be Saved As Raster Files : you can save a vector file as a raster file. 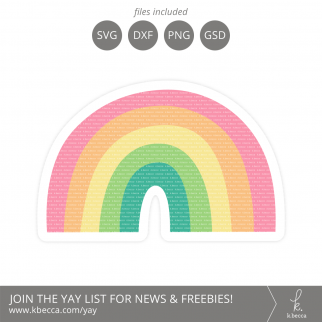 For example, you can save an SVG as a PNG or a JPEG, but if you do this, the resulting file will be resolution dependent and won’t be able to be scaled to a size that’s larger than the size that you save it as without losing image quality. Raster files, on the other hand, cannot be saved as true vector files. They can be embedded in vector files, but they won’t actually be vector files. Why Use : the big plus with vector images is their scalability. Their file sizes tend to be smaller, which is a plus, but they tend to have large areas of flat color, as opposed to lots of texture and color. You can recolor vector graphics in Silhouette Studio, which is another plus. A little while back, I received a set of Koh-I-Noor Tri-Tone Pencils as a gift, and I wasn’t really sure what to do with them at first. But once I started using them, I really liked the dynamic, impressionist-style look that they give to projects. In other words, I think they’re pretty cool! If you want to have complete control over your colored pencils, then this probably isn’t the set for you, but I like the element of surprise that comes along with the Tri-Tone pencils and think that they would make a great set for beginners because they allow you to more quickly and easily create color variation and depth of color, both of which can be a big challenge when you’re first starting out with colored pencils. Layering color is absolutely key when it comes to colored pencils – and many different coloring mediums, actually – so I started off by laying down a few very light layers of color, gradually building up the color and pressing harder to lay down deeper color as I worked. 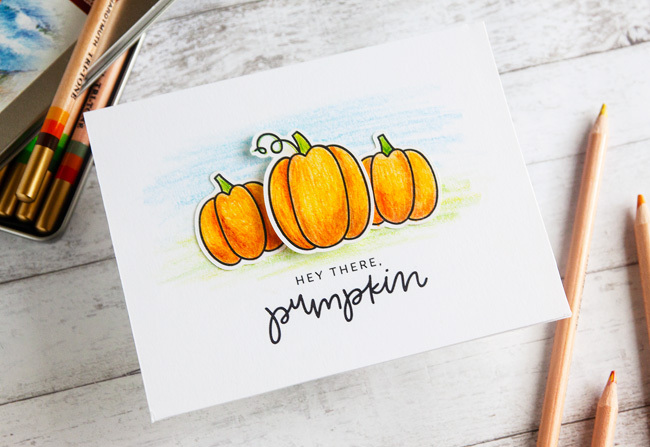 After I was finished coloring the pumpkins, I colored a very loose sky and grass background on the card base, also using the Koh-I-Noor Tri-Tone pencils. 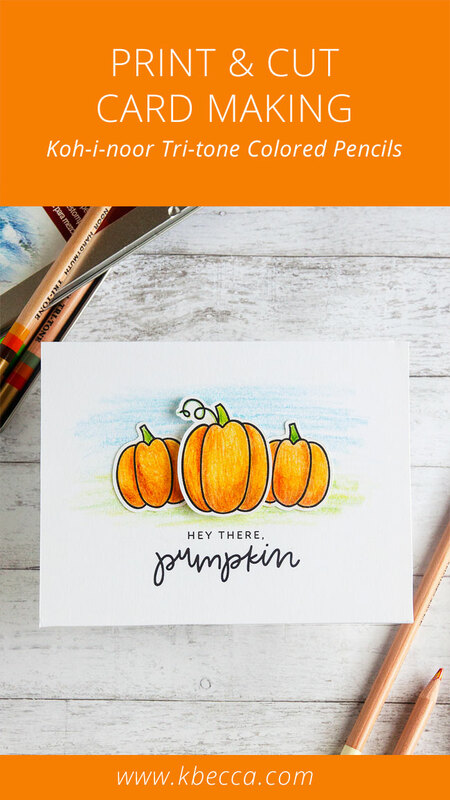 I made this easy and colorful card using the Silhouette print & cut feature and the Happy Fall Digital Stamps set that you can find in my shop, and you can watch the step-by step tutorial in the video below.